Robot 500 – See The Light! There are lots of “500” races, and one of the most famous is the Indianapolis 500 in the United States of America, which has been raced since 1911. 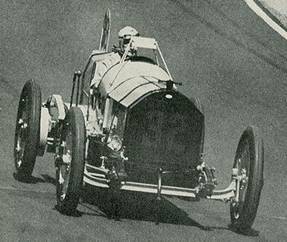 The image below is the first winner, Mr. Ray Harroun driving a Marmon “Wasp”. The cars are a lot more streamlined now, see the image below of the car that Australian-born New Zealander Scott Dixon drove to win the 2008 Indianapolis 500 race. The Indianapolis 500 has walls all around the track, but let us use a strip of silver tape to represent the walls, and see if we can teach our Robot to navigate around the track just using the light sensor to guide it. Perhaps not 500 laps - we would never get home in time for tea – but what about 2 laps? Your Robot will have one or more light sensors mounted low on their body. The light sensors will have to be fairly low to allow the sensor to see the light reflected from the track surface. A distance of about 5 mm. to 7 mm. between the bottom of the light sensor and the track is a good starting distance, but experiment and see what sort of distance works best for you. If your mentor or teacher agrees, any size of robot can be used – the main idea is to have fun learning how to teach your robots to do what you want them to do. Think about where you want your Robot Racer to go after it starts. What is the easiest way to instruct your robot to get around the central silver strip? 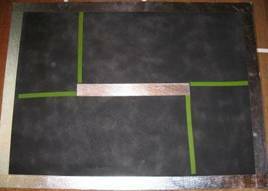 What is the easiest way to teach your robot to stay straight so that it does not run over the arena's silver edge tapes and leave the course? What is the easiest way to teach your robot to go around the course really really fast? Is the easiest way the best way? Is your robot securely built – will it fall apart before finishing five laps? Your Robot will start from a “Ready, Set, (loud handclap)”. A Robot has to restart from its original start position if it leaves the course. The best Robot could be the one with the most laps at the end of 2 minutes. If the number of laps is the same, the Robot with the shortest time could be judged the best. If the best robot can not be decided after a round of two Robot Races, a third race with a 3 minute time limit could be held, with the Robot that covered the most number of laps being the best Robot on the day. If the Robots still cover the same number of laps, then the result is a draw! Mentor note: A two page Microsoft Word 2003 version of this Challenge can be seen by clicking here.